The Garlands have recorded a new version of the song 'I Don't Intend To Spend Christmas Without You'. It was written by New York songwriter, lyricist, pianist and singer Margo Guryan for French actrice, singer and dancer Claudine Longet, who recorded it in 1967. Earlier that year, Claudine Longet had recorded another song of Margo Guryan, 'Think Of Rain', in fact the first song Margo Guryan wrote after switching from writing jazz songs to pop songs. In the first ten years of her career as a songwriter, Margo Guryan had mainly written jazz and jazz-inspired songs, that had been recorded by artists like Harry Belafonte, Chris Connor and Nancy Harrow. She also wrote lyrics for compositions of jazz greats like John Lewis, Ornette Coleman and Arif Mardin. After a friend played 'God Only Knows' of the Beach Boys album 'Pet Sounds' for her, a complete new world opened for Margo, and she decided to switch from writing jazz songs to writing pop songs. Margo Guryan is mainly known as a songwriter, although she did record a solo album in 1968, 'Take A Picture', but not wanting to tour to promote the album, the album was not a succes, and remained her sole solo release, until several demo recordings she did of songs she wrote for other artists, were released on the CD compilation '25 Demos' in 2001. That compilation also features her own version of 'I Don't Intend To Spend Christmas Without You'. It was Tommy Li Puma, head of A&M Records, who had asked Margo to write a Christmas song for Claudine Longet. He explicitely requested to make it a song without all the common Christmas stuff, like snow, misletoe, presents. It was the only time Margo wrote a song with a performer in mind. She wrote the song, recorded a demo version, that was send over to California, where Claudine recorded it. In line with the reques of Tommy Li Puma, the song was about Christmas, but had nothing to do with the usual cheerful Christmas celebration, although in the end, the message of the song was a positive one. Two people separated, but in the end, it turned out they only wanted to show the other how it feels to be alone, and to not be together. In the end, the lesson is learned and the singer returns to her love, as, she tells him, “I don't intend to spend Christmas without you'”. The singer who Margot wrote the song for, Claudine Longet, was born in Paris in January 1942, and had just seen her major breakthrough the year before Margot wrote the song. In 1967, Claudine Longet had released several singles and two albums, and her label A&M Records was very active in promoting her as their major female star. At the time, Claudine Longet was married to Andy Williams, well known for the many Christmas songs he recorded, among those one of my personal favorites, 'It's The Most Wonderful Time Of The Year'. Both Claudine and Andy felt a strong connection with Christmas. It was no coincidence that had married on Christmas Day, 1961 and that they named their first two children Noëlle and Christian. So it was no suprise that Claudine sooner or later would record a Christmas song. Claudine was originally from France, but already went to the USA as a teenager, and became the lead dancer of the Folies Bergère revue at the Tropicana Resort & Casino in Las Vegas. She met Andy Williams in 1960, when he stopped when he saw her standing by the side of the road with car trouble. The first few years of her marriage, Claudine was mainly playing in tv series and she also appeared several times on the Andy Williams show. Occasionally she also appeared as a singer on tv. Her big breakthrough came when she sang a English-French bilingual rendition of the bossa nova song 'Meditation', in a style that soon would become her trademark: singing with a soft sensuel voice, filled with longing and melancholy but also with a cheerful optimism. Herb Alpert offered her a recording contract with A&M Records. 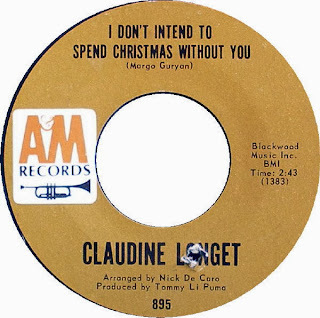 Between 1966 and 1970 Claudine would record five albums and many singles for the label, one of these singles being 'I Don't Intend To Spend Christmas Without You'. The single went to #30 in Billboards 1967 Christmas list, but did not chart in the Hot 100, nor in the Adult Contemporary list, like some of Claudine's other singles. Claudine went on to star with Peter Sellers in the great Blake Edwards movie 'The Party' in 1968, divorced from Andy Williams in 1975, and was convicted a year later for fatally shooting her then boyfriend, Olympic skier Vladimir Sabich. She later married her attorney in the proces, and has not performed since the trail, despite the fact that interest in her music has resurged following several CD releases. In the late 1990s, when sunshine pop became popular again, the song got back in the spotlights, which lead to several cover versions. Saint Etienne, known for having released several Christmas singles over the years, covered the song in 1998 for a Christmas fanclub release (unfortunately, only on a CD single). Tomorrow's World also covered the song on the compilation 'The World In Winter', a CD compilation from the UK that was released in 1999 by the Él label. Indie electronic duo Lover And Poets covered the song, in 2010, on their bandcamp site. Maylee Todd was the most recent one to cover the song – it appeared on Soundcloud in December 2012. Japanese band Pizzicato Five, who by the way inspired me to christian this project 'Snowflakes Christmas Singles' with their song'Snowflakes', sampled Claudine Longet's version on their song '20th Century Girl' on their 2000 album 'The Fifth Release From Matador'. The Garlands version of the song is the first time since 1967 the song has appeared on (7”) vinyl again!